On the heels of a United Nations report this week sounding warnings about the impact of global climate change, the Mother Earth Project will bring its Parachutes for the Planet display to Georgetown this weekend. WASHINGTON — On the heels of a United Nations report this week sounding warnings about the impact of global climate change, the Mother Earth Project will bring its Parachutes for the Planet display to Georgetown this weekend. Hoping to repeat the success the HIV/AIDS Quilts project had in drawing attention to a cause during the 1990s, the Mother Earth Project will display 200 parachutes from 30 countries and 28 U.S. states Oct. 13 from 11 a.m. to 4 p.m. at the Georgetown Waterfront Park. The event will also include politicians, organizations and heads of schools, a 100-foot parachute dance, live music from five bands and a march in the park with the Bethesda-Chevy Chase High School Drum line. “Saving the environment is vital to our health, safety and future, and ‘parachutes’ are a metaphor for this process,” Mother Earth Project said. The group has collected more than 250 nonfunctioning parachutes from individuals and organizations, each painted with their specific artwork and message. Mother Earth Project has been displaying its Project Parachutes display at large venues worldwide. 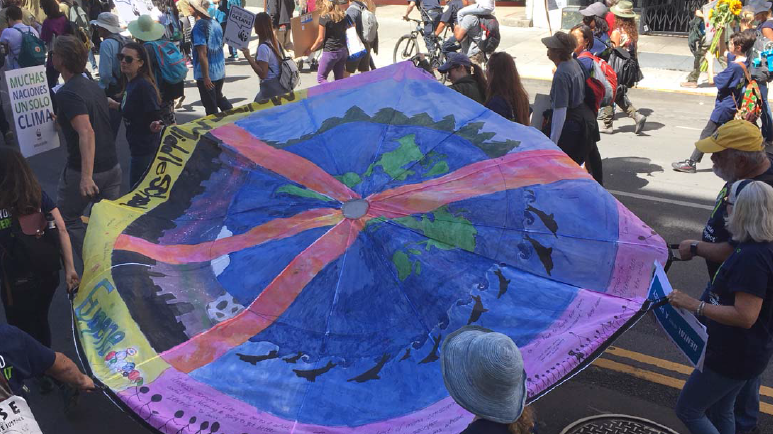 In July, 100 parachutes were displayed at the National Mall as part of the Zero Hour Youth Climate march, and were carried to the offices of more than 40 U.S. senators. The nonprofit has also been installing permanently displayed sculptures, including one on the Potomac River in Georgetown, as well as in Guilin, China; Yaounde, Cameroon, and Jerusalem.